Image courtesy of In an effort to increase foot traffic at its stores, Walmart has slashed prices on the iPhone 5S ($49), iPhone 6 ($129), and iPhone 6 Plus ($229). It’s been a few weeks since an Apple CEO summoned the news media to gather before him to be told about the latest incarnation of the iPhone. Sometimes the CEO’s proclamations are worth the attention. Sometimes they are barely worth a press release (yes, we’re looking you, iPhone 5C). Where would today’s announcement fall on that spectrum? We attempted to watch the live stream on Apple.com, but all we got were loops of the same repeating videos and a few seconds of Apple execs talking that was drowned out by a translation (we believe in Mandarin, but we’re not sure), so we have to go on what others are writing in their live blogs about the announcement. The first piece of news was the introduction of two new iPhones — the iPhone 6, and the iPhone 6 Plus. Following the trend of giving consumers more screen space, both devices have bigger displays, with the the iPhone 6 at 4.7″ and the 6 Plus at 5.5″. In spite of the bigger screens, both phones are thinner than the iPhone 5S, which measures 7.6mm. 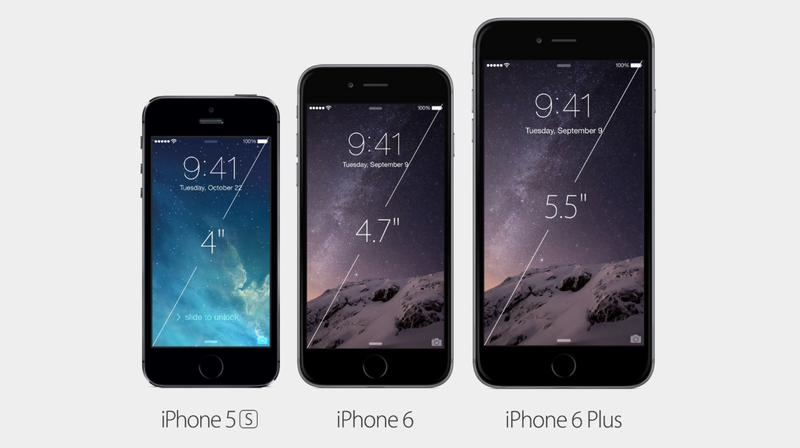 The iPhone 6 will be 6.9mm while the 6 Plus comes in at 7.1mm. One advantage the iPhone 6 Plus has over its slightly smaller counterpart is that the home screen can now be presented horizontally on the device, much like you would on the larger iPad. The new Apple A8 chip used in both of these phones is improves graphics performance by 50% over the previous generation, says the company. Apple is betting on this making the device more attractive to use as portable gaming device. Both devices have improved batteries, with the 6 Plus benefitting from the larger real estate. According to Apple, you can 50 hours of audio play out of an iPhone 6 and 80 out of the 6 Plus, compared to 40 for the 5S. Video play time maxes out at 14 hours on the 6 Plus while the iPhone 6’s 11 hour max is slightly better than the 10 for the 5S. The new M8 motion processor can now detect things like distance and elevation and has a barometric sensor. Cameras on the new devices will allegedly focus twice as fast as the existing iPhone cameras. The 6 Plus has optical image stabilization while the iPhone 6 has only digital stabilization. For fans of super slo-mo footage, the new video cameras on these devices will shoot at up to 240 frames per second. The cameras will also shoot at full 1080p up to 60fps. The iPhone 6 will start at $199 with a two-year contract for the 16GB model; $299 for 64GB; $399 for 128GB. The 6 Plus models are each $100 more, so $299, $399, $499, respectively. They will start shipping Sept. 19 in the U.S. Speaking of money, Apple announced Apple Pay, a new payment system that uses the phones’ fingerprint sensors and their new NFC chips that allow the device to communicate with certain devices within a very limited range. Users can store their credit card info in the phone’s Passbook app. Cards on file with iTunes can be easily loaded into the system, and others can be scanned into the phone with the camera. Apple claims the information is securely stored on the phone. Users who lose their devices can remotely wipe this data from their devices using the Find My iPhone app. Additionally, it appears that the account numbers stored on your device are unique to the phone and not identical to what is on your card. The company says it receives no transaction data, so it is not tracking where you shop or what you buy. Apple Pay will be available at some 220,000 payment terminals in the U.S., including McDonald’s, Macy’s, Staples and Walgreens. Retailers with iOS apps will be able to integrate Apple Pay into their systems so that you can make purchases online this way. Apple says that Target is already working on this, as is Groupon and Major League Baseball. “What we didn’t do was take the iPhone interface and strap it on your wrist,” explained Cook, pointing out that things like pinch-to-zoom simply wouldn’t work on such a small screen. 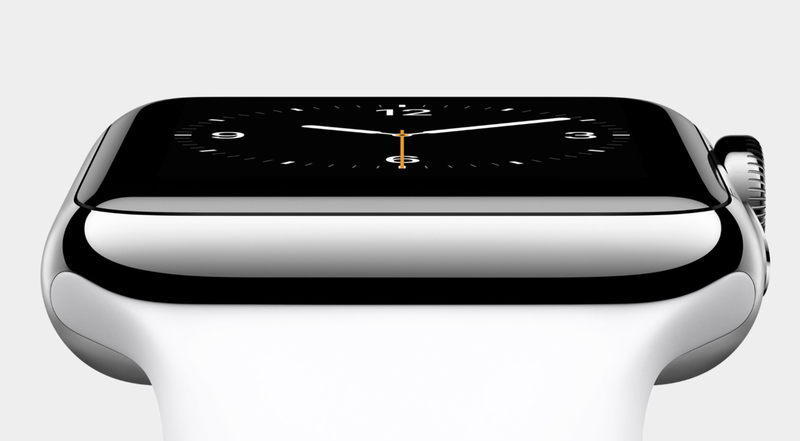 Instead, the “digital crown” dial on the side of the Apple Watch is the key to navigating the screen. You use it to scroll, zoom, return to Home screen, etc., without having to block the screen. Next to the crown is a button that immediately brings up contacts for you to browse and text, e-mail, or call. The watch uses a flexible retina display that senses both touch and force, so the watch can tell the difference between a light tap and a more forceful push. “We thought not only of the function, but of the way it looks,” said Cook, perhaps making a dig at existing smart watches that don’t exactly appeal to fans of fashion. The Watch will be available in two different sizes, along with a variety of straps to choose from, ranging from sweat-resistant plastic to leather. The straps are easily interchangeable, says Apple. The three versions of the device are each cased in a different metal. The basic Apple Watch version is made out of a stainless steel alloy, the Sport edition is aluminum, the Apple Watch Edition is 18 karat gold. Android users need not apply. You need an iPhone (5 and beyond) to use an Apple Watch. Siri is integrated into the Apple Watch, and it also syncs up photos from your iPhone to your watch. The maps app on the device can also point you in directions without having to look at the screen. If you have to turn right, it will generate a certain type of haptic feedback; left will be a different type of feedback. You can also use the haptic feedback on the Watch to communicate with other friends wearing an Apple Watch. Tap on the screen and they may be able to sense it. You can also, for some reason, send each other your heartbeat. There are also all sorts of health-related apps, but I fell asleep during that overlong video portion of today’s marathon presentation. Finally, Cook announced that the Apple Watch will go on sale in early 2015, starting at $349.